(Newser) – This is apparently not a joke. 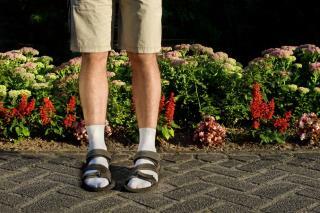 According to DNAinfo New York, stylists have picked up on socks with sandals as an emerging fashion trend. The look, often spotted on grandmas and tourists, has also been popping up on fashion runways in shows by Kate Spade, Tory Burch, and Burberry, prompting fashionistas to jump on board. "Layering sandals with socks is the perfect way to transition seasons," a stylist explains—just make sure to wear "lightweight and solid-colored socks with flat-formed shoes." Not in a million years would I wear socks with sandals!! !